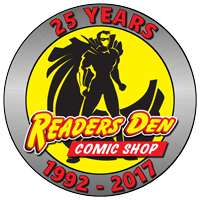 New shipment of comics , graphic novels & figures ! All categories have been updated with the new items. Here is a complete list of new comic releases available in store from Wednesday 6 February. Note : this is a complete list of comics received, some are available as shelf copies at either of our stores (Claremont / Tyger Valley), the rest are subscription orders.